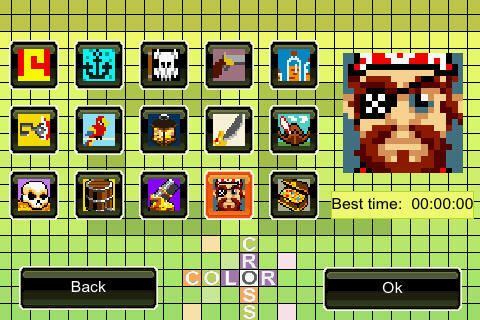 Color Cross is one of the best Picross-style games to show up on at the App Store. If you’ve played Color Cross or Picross on the Nintendo DS, then you’ll already know what I’m talking about, but the rest of you may need a brief introduction. 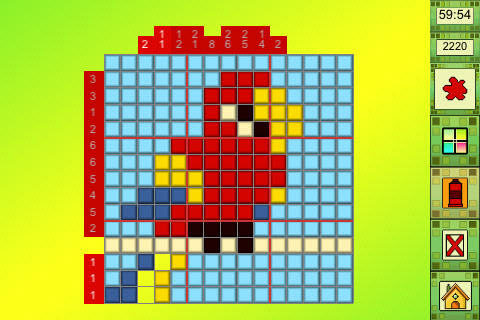 Picross/nonagram games are sort of like the puzzle-y lovechild of sudoku and Mastermind. You start off with an empty grid with numbers along the outside. The numbers indicate how many squares in the grid should be filled in, and through a careful logical analysis, you can fill in the grid so as to make a picture. These types of puzzles are also sometimes called paint-by-numbers, and in the case of Color Cross, you have a whole lovely palette to work with. If my description confused you, don’t fret. The game comes complete with a full tutorial to fill you in on all the basics. The game mechanics themselves don’t take long to grasp, but there’s plenty of mental challenge involved with the levels themselves, and there are plenty of those. With literally hundreds of puzzles to choose from, many spread across specific themes, this is a game that can easily keep you occupied for hours at a time. You have your choice between Classic and Arcade mode. All levels are timed, to add an extra element of challenge, but Classic has you selecting puzzles to ponder one at a time from 10 different themes, while Arcade just lobs puzzles until you run out of time. For the price, this game is absolutely outstanding, since it easily costs ten times as much on the DS. The main difference between the two is the interface, which can take some getting used to if you’re more accustomed to a stylus, and touch penalties can become an issue if you’re a bit fumble fingered like myself. Using the standard pinch zoom mechanism, you can get in close to color in specific squares with a tap or a swipe for multiple squares, but you’ll want to zoom out again to scrutinize the overall picture. For the most part, the interface is easy enough to use, but in addition to the frequent touch penalties, the swipe-to-color mechanism was a little fussy at times. Overall, I was really pleased with this well-done port. I haven’t played the DS original, so I can’t speak to any differences in content, but I have played similar games on various platforms, and in terms of variety and polish, Color Cross is an extremely satisfying experience. The addition of color just makes the game that much prettier. Vastly more visually stunning than sudoku, Color Cross is a gorgeous and bite-sized intellectual snack. AppSafari review of Color Cross was written by Tracy Yonemoto on September 21st, 2010 and categorized under App Store, Art, Featured, Games, Puzzler. Page viewed 3926 times, 1 so far today. Need help on using these apps? Please read the Help Page.